Back in 2008, Californian founders of Houzz, Adi and Alon set out on a journey to redesign their home. In the way that so many of us do, they reached for stacks of home magazines, compiled details of home professionals and took notes of referrals from friends. However, when those piles of torn out pages and details failed to help them bring their dream home to reality, they sought to find a better way. And so, Houzz was born. Houzz is an online platform specifically focused on home renovation and design. The vision behind it was to bring homeowners and home professionals together in a uniquely visual community. And for those of you who have used Houzz, it’s clear that the visual element is key, no blurry or low-resolution images in sight! In a similar vein to another visually driven social platform ‘Pinterest’, Houzz is a quick and easy tool that allows you to research and collate interior images that appeal to you. Think of it like an online scrapbook, or mood board, for your interior projects. Whether you’re looking for inspiration to refurbish your whole house, revamp your bathroom, right down to specifics home products like the perfect copper pendant lamp. Houzz is your go-to visual encyclopaedia. As a Houzz member, you can browse photos by room, style and location, and bookmark photos in personal collections named ‘ideabooks’. You can click on images to learn more about the designer, ask questions, and learn about specific products tagged in the photos, e.g. a paint colour or worktop material. Houzz also helps you to find home professionals, designers and architects near you. What started as a side project has now become a community of more than 40 million homeowners and Houzz is now globally recognised as THE social platform when it comes to home design. 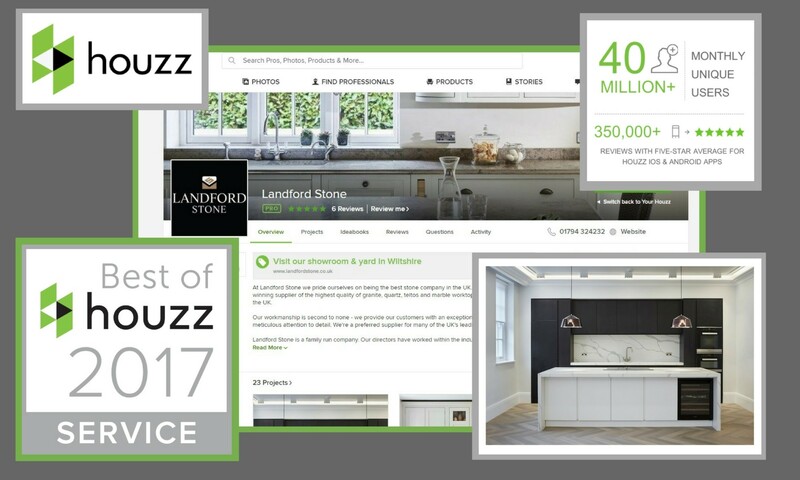 At Landford Stone, we’re thrilled to have won the Best of Houzz UK Service award for 2017. The Award is allocated based on reviews from both our clients and other companies we have worked with. We pride ourselves on being the ‘best of the best’, and we are over the moon to have received this Award from such an influential platform which showcases the best in home design that the UK has to offer. See our Houzz projects and be inspired!